Italy has always lured visitors in search of romance and culture. Dreamy seaside resorts, mythic medieval villages and awe-inspiring antiquities create the perfect backdrop for an enchanting honeymoon. You’ll be swept away by the extravagant beauty of Venice. You’ll experience a fairy-tale world in the picturesque hill towns of Tuscany. You’ll be awestruck by the colossal beauty of Rome. Every destination features luxurious hotels and delicious food to celebrate your special occasion. For an extra special touch experience a luxury train journey from London to Venice. 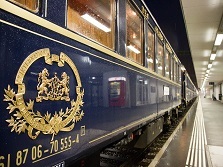 Enjoy your journey from London to Venice on the magnificent Venice Simplon-Orient-Express and experience a luxurious overnight trip via Paris. This classic itinerary, your time on board will be wrapped in timeless romance. From the vintage carriages and liveried stewards to the refined cuisine and fine wines, each moment is sure to become a treasured memory. Arrive in Venice where you will stay for three blissful nights. You will be met at the airport for private transfer service to the hotel. Enjoy breakfast at your hotel. Set off for a Walking Tour Discovering Venice with a visit to Doge’s Palace. This two‐hoursightseeing tour will introduce you to the city centre of Venice. Through your private guide,you will have a chance to learn about the history of this ancient town while touring some of the city's most celebrated monuments. The tour will start from San Marco square, central landmark and gathering place for Venice. The buildings around the Piazza are the Doge's Palace, St Mark's Basilica, St Mark's Clocktower, Procuratie Vecchie, the Napoleonic Wing of the Procuraties, the Procuratie Nuove, St Mark's Campanile and Loggetta and the Biblioteca Marciana. St Mark's Basilica, known also as the Golden Basilica due to its opulent design and gilded mosaics, is one of the best known examples of Byzantine architecture. The tour will take you inside the Palazzo Ducale di Venezia (Doge's Palace), the old residence of the Doge of Venice. Additionally, you’ll enjoy a private gondola ride, the perfect way to begin your honeymoon. Your scenic tour takes you through the smaller inner canals of Venice, quiet and picturesque areas that bridge together the different neighborhoods of Venice. Your guide will point out important architectural sites and historical references, as well as introduce you to the characteristics of the distinct Venetian neighborhoods, known as sestieri. Enjoy breakfast at you hotel.The main attraction of Venice is simply being in Venice, so be sure to explore with or without a map. Venice is like a jewel box filled with treasures. You’ll find amazing artistic and cultural gems at every turn: hidden artisan workshops, forgotten piazzas, and historic places of worship. In the evening, enjoy a wine tour with an expert wine guide, who also happens to be a professional sommelier. The tour will give you a sneak peak into local life while you learn about traditional Venetian wines. Get a glimpse into the real Venice as you visit several enoteche (wine bars) off the beaten path in a less-touristy area of Venice. At each wine bar, your sommelier will select a few typical wines for you to sample. Your guide will share the history of Italian wines and its role the Italian culture. Regardless of your level of wine knowledge, this walk is both informative and fun. Enjoy breakfast at you hotel. You will be transferred to the train station where you will board your train for Florence. Upon arrival you will be transferred to your Tuscan hotel. The remainder of the day is at your leisure. Enjoy breakfast at your hotel.You will get a glimpse of the famous art works at the Duomo (Cathedral) as well as Brunelleschi’s Dome, while you visit such famous landmarks as the Baptistry’s Gates of Paradise, Bell Tower, Ponte Vecchio, Vasari’s Corridor and Medieval towers. You’ll hear about the history of Florence and its famous rulers and artists, as we stroll by Renaissance palaces, beautiful piazzas, markets and famous shopping streets. This private tour of Florence will also take you on a private tour of the Uffizi museum. The Uffizi occupies the top two floors of a building originally designed by Giorgio Vasari, a leading 15th century painter and architect. Today, it is one of the most famous and important art museums in the world. Your English-speaking tour guide will show the Uffizi’s acclaimed masterpieces by Botticelli, Fra Angelico, Felippo Lippi, Raphael, Michelangelo, Caravaggio, Giotto, Leonardo da Vinci and many others. German, Flemish and Dutch masters like Rubens and Rembrandt are also well represented. Enjoy breakfast at your hotel. Today you will enjoy a Food & Wine tour. Your tour will depart at 9:00 am. Treat your taste buds on a full‐day Chianti wine and food tour from Florence and sample some of Tuscany’s finest wine, cheese, meat, chocolate and more! With a local guide who is passionate about the region’s food heritage, travel through the countryside by 4x4 minibus and tour a medieval castle and wine estate, a pecorino cheese factory, and a Chianti Classico winery. Up to seven glasses of wine are included throughout the day, plus several food samples and a 3‐course meal at a traditional restaurant in the Chianti hills. Arise for an early departure for a breathtaking hot air balloon flight over the Tuscan Countryside with a Champagne Toast. Have breakfast upon your return to your hotel. See for miles over the beautiful Tuscan countryside on a 1‐hour hot air balloon flight, taking place from the village of San Casciano in Val di Pesa. Soaring up to some 2,000 feet (609 meters) above ground, admire stunning aerial views of the rolling hills, pretty villages, imposing castles and sprawling vineyards and olive groves of Tuscany. Then, toast the unforgettable experience with a glass of Champagne upon landing. Convenient round‐trip transport from your Florence hotel is available. Tour departs approximately 5:00 am with 3 hours total duration. Enjoy breakfast at your hotel. You will be transferred to the train station where you will board your train for Rome. Upon arrival you will be transferred to your hotel. The remainder of the day is at your leisure. Enjoy breakfast at your hotel. Today you will enjoy a sightseeing tour of Rome. 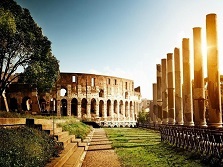 Your private walking tour includes visits to the landmarks of Imperial Rome, such as the Coliseum, the Roman Forum, the Circus Maximus and Capitol Hill. This tour explores the area of Rome from where the power and the glory of the Great Roman Empire developed and extended. Your guide will meet you at your hotel and take you through the enchanting ruins of the Imperial‐era, beginning with the Piazza Venezia and its impressive monument dedicated to King Victor Emanuel II and the Unknown Soldier. You will then continue on foot to the famous Piazza del Campidoglio designed by Michelangelo, from where you will have a breathtaking view of the Roman Forum. With the remains of the Forum as a backdrop, you will have a chance to learn from your guide the history and anedoctes on the social and political life of Rome, from its origin to the glorious days of the Great Roman Empire. Proceed with the visit to the imposing Coliseum, iconic symbol of Imperial Rome, and probably the most impressive building of the Imperial‐era. Enjoy breakfast at your hotel. Enjoy Rome at your leisure. Enjoy breakfast at your hotel. You will be transferred to the train station where you will board your train for Naples. Upon arrival you will be transferred to your Amalfi Coast hotel. The drive in itself is breathtaking, as you travel along steep cliffs overlooking the sparkling Mediterranean Sea. You’ll be staying in Ravello, the most elegant spot on the Amalfi Coast. This hilltop resort town offers sensational views of the surrounding coastline. The best vantage point is from the “Terrace of Infinity” at the Villa Cimbrone’s lush gardens. Adorned with classical marble busts, this incomparable balcony overlooks the sea and the Amalfi Coast all the way to the mountains of Cilento. Here you can capture the ultimate honeymoon photos with a beautiful backdrop. In the summer, the nearby Villa Rufolo is a popular venue for festivals and concerts. The remainder of the day is at your leisure. Enjoy breakfast at your hotel. Explore the Amalfi Coast and Capri on a private full-day cruise, the most scenic way to experience these stunning parts of southern Italy. Aboard an elegant speedboat or classic Italian wooden boat (your choice), let your private captain take you past the towns of Amalfi, Positano, Praiano and Nerano. Marvel at the Faraglioni rock formations and the Li Galli private islands and nature reserve, stopping en route to swim. Cross the Bay of Naples to the Island of Capri, where you’ll have free time for sightseeing at the Villa San Michele and Gardens of Augustus. Enjoy breakfast at your hotel. On this you penultimate day in romantic Italy, you are free to go at your own pace. Perhaps enjoy a refreshing couples massage and in the evening a romantic dinner for two! The possibilities are endless and the choice is yours; the entire day is at your leisure. Depart Italy - Ciao, Italia! Enjoy breakfast at your hotel. Today sees you leaving this remarkable country. Enjoy one last breath of fresh Amalfi Coast, and get ready to return home and begin your new life together. You awake to the magnificent mountain and countryside scenery as breakfast is served in your cabin at a time to suit you. Spend the morning relaxing in your cabin or in the Bar Car chatting to fellow guests. Enjoy a leisurely three-course lunch which is served in another one of the beautiful restaurant cars. While away the afternoon admiring the passing scenery. Later, afternoon tea is served in your cabin. All too soon it is time to prepare to disembark as the train crosses the Venetian Lagoon and pulls into Santa Lucia station. You will be met at the train station for private transfer service to the hotel.